and how to avoid them? We do, and we hope you read this before YOU make one of these mistakes yourself. Mistake Number 1. YOU TRY TO GET THE HYPNOTIST WHO CHARGES THE LEAST AMOUNT OF MONEY. It’s true that the budget you set is important, but often by trying to save money you don’t get the BEST performance. The old saying is true: You get what you pay for. Today, anyone can get a book about becoming a hypnotist and begin advertising their services. Do you want to jeopardise your entertainment (and your reputation) by hiring the lowest priced hypnotist out there? Mistake Number 2. YOU THINK ALL HYPNOTISTS AND THEIR SHOWS ARE THE SAME. Wrong! All stage hypnotists have different capabilities, experiences, and routines. Some have little or no training. Truthfully, some are simply NOT funny and don’t have a stage ‘presence’ that grabs the crowd. You would be wise to check their level of experience and how long someone has been performing before you sign a contract. Mistake Number 3. LAST MINUTE SHOPPING. Great entertainment is often hard to find. It’s even more difficult when you continually put it off. Entertainers are often booked months in advance. To avoid extra travel expense and last minute hassles; SAVE MONEY, TIME and HEADACHES by reserving your entertainment sooner versus later! Adam Night is one of a few stage hypnotists who does have FULL public liability insurance. All performances are fully covered, including in trance cover and psychological damage. If you are booking a hypnotist for your event, please check their insurance or YOU may be held liable. These are some, but not all the mistakes you can make. I’m sure there are more. If you want to book the best stage hypnotist in the UK, what should you do? 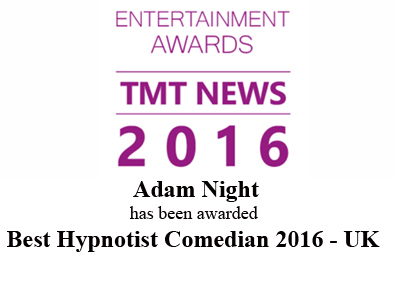 Well, Adam Night has been a top stage hypnotist for over 25 years. Besides his hilarious, funny hypnosis stage act, Adam is a Certified NLP practitioner and sees patients on a wide variety of issues. He has been delighting audiences all over the country with his performances at holiday parks, corporate parties, college campuses and many other venues. If you are looking for a show that your audience will talk about for months and remember forever, Adam Night is the hypnotist for you. As you can imagine, Adam Night’s calendar fills up fast, often many months ahead. If you want Adam for your entertainment, you MUST let us know as soon as the date for your event is final. We can, in some cases, put a ‘hold’ on a date before the formalities are completed, but you must act now.